Tuesday, December 24, 2013 was the Feast of St. Stepehen the protomartyr and first deacon. 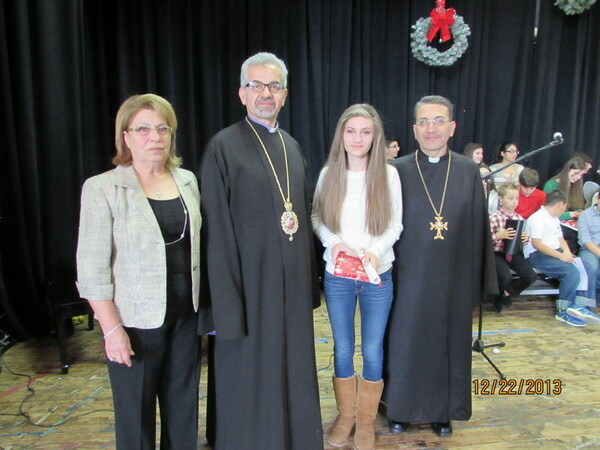 On Sunday, December 22nd, sermons in Prelacy Churches focused on the life and example of St. Stephen. H.E. 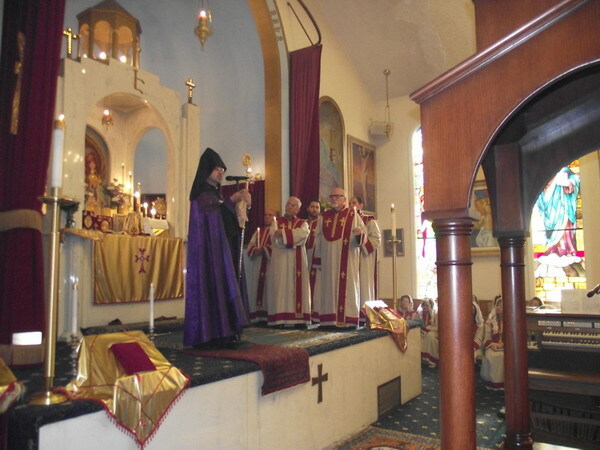 Archbishop Moushegh Mardirossian, Prelate, presided over Divine Liturgy and delivered the sermon at Holy Martyrs Church in Encino. Given that St. Stephen was the first deacon, this feast is a celebration of deacons. Thus, the Prelate also blessed deacons during the service. Parish Pastor Rev. Fr. 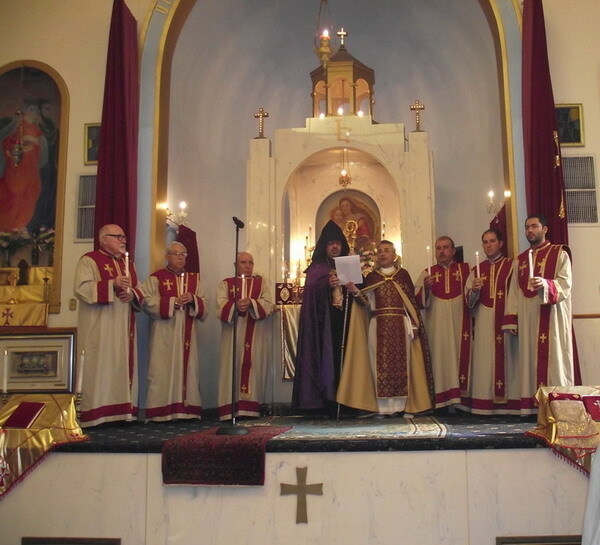 Razmig Khatchadourian celebrated Divine Liturgy. H.E. 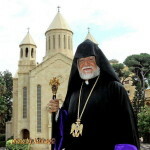 Archbishop Yeprem Tabakian participated in the service. Prior to the Prelate’s sermon, Fr. 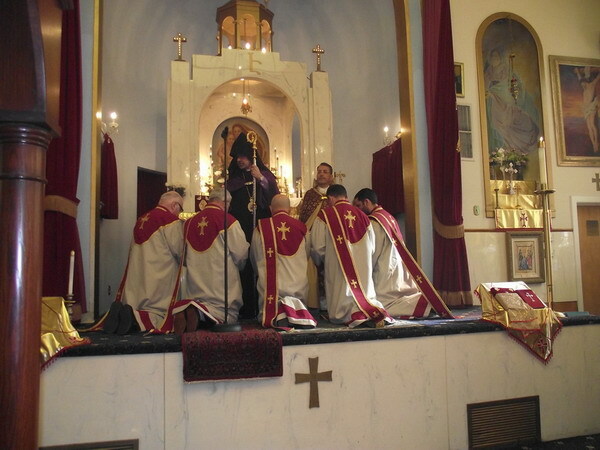 Razmig invited the deacons to the altar to receive the blessings of His Eminence. With the singing of the St. Stephen hymn, the six deacons ascended the altar, candles in hand, and knelt before the Prelate for his blessings. His Eminence then began his sermon. The Prelate first spoke on the day’s Gospel reading from Luke 18:9-14, the Parable of the Pharisee and the Tax Collector, the message of which is that whoever exalts himself will be humbled and whoever humbles himself will be exalted. Connecting this message with the Feast of St. Stephen, the Prelate spoke of the saints humility, unwavering faith, and devoted life of service, which led to his designation as the first martyr and the first deacon. As told in Acts Chapter 6, after the Ascension of Christ, when the number of the disciples was multiplying, there was a complaint against the Hebrews by those whose widows were neglected in the daily distribution. So the Apostles called together the disciples saying it is not desirable to leave the word of God and serve tables, and therefore asked that they seek our from among them seven men “full of the Holy Spirit and wisdom” to carry out that mission. Thus, St. Stephen, “a man full of faith and the Holy Spirit” was chosen as the first deacon. The Prelate exalted the staunch faith and selfless service of St. Stephen, and addressing the deacons gathered on the altar said, “Deacons and church servants, today is your day. Pledge that you will follow in the ideal example set forth by St. Stephen by living with humility, serving with devotion, spreading the peace and love of Christ, and faithfully fulfilling the responsibilities and obligations of your calling as deacons”. The Prelate concluded by conveying his blessings and well wishes to all for a Happy New Year and Merry Christmas. 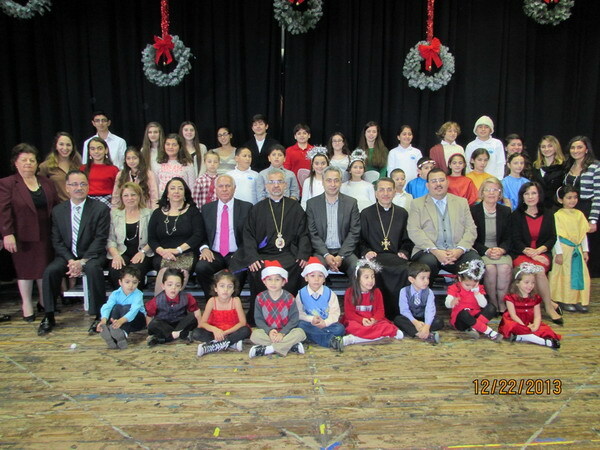 At the conclusion of services the Prelate presided over the Sunday School Christmas program at Avedissian Hall. 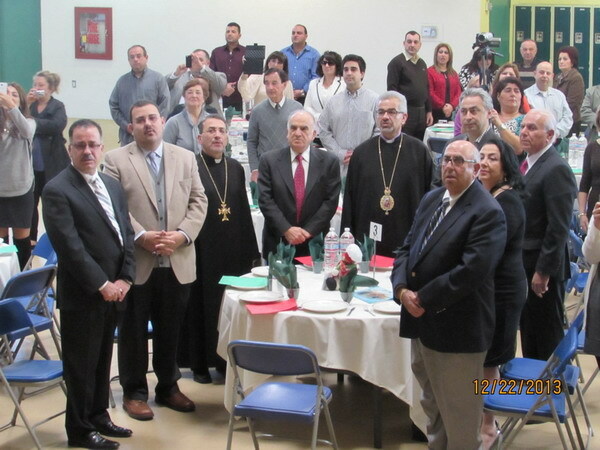 The program began with the Armenian and Sunday School anthems sung by the students. 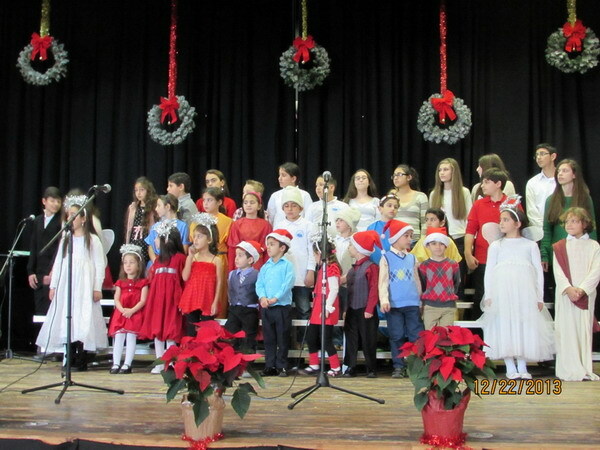 Master of Ceremonies Ms. Zabel Karaghossian welcomed the guests and on behalf of the Sunday School director and staff wished them all a Happy New Year and Merry Christmas. 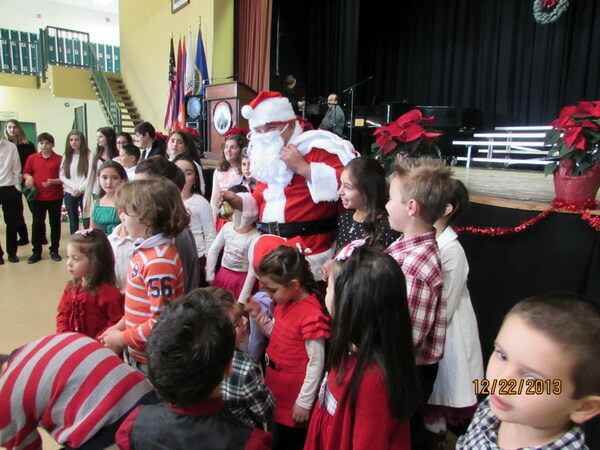 First grade students presented songs, recitations, and prayers, and conveyed their wishes from Santa Clause. 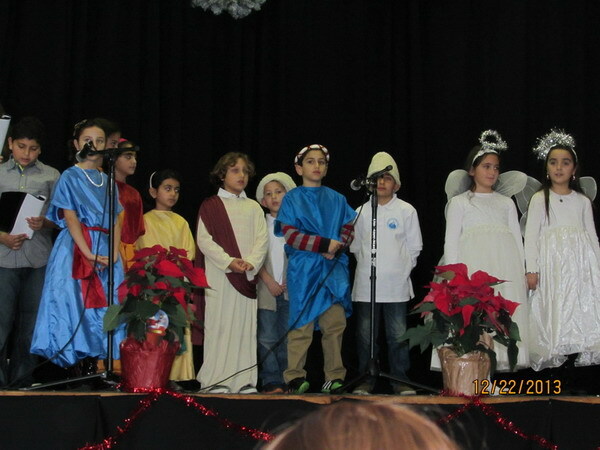 Second grade students presented the Birth of Christ, accompanied by Armenian Christmas hymns and songs by third and fourth grade students. On behalf of the Board of Trustees, member Mr. Greg Martayan spoke of the Sunday School as “a vital pillar of our church which instructs and prepares our youth to take their first steps in church life”, thanked the guests for their encouragement and support of the Sunday School’s mission, and commended the director and teachers for their service. Director Mrs. Seta Kejejian first thanked the Prelate for his presence and wished him a happy, healthy, and successful New Year. Citing verse 6 from Proverbs 22 which says, “Train up a child in the way he should go, and when he is old he will not depart from it”, Mrs. Kejejian highlighted the value and crucial role of Sunday Schools and commended the staff for their dedication to the instruction of the youth. 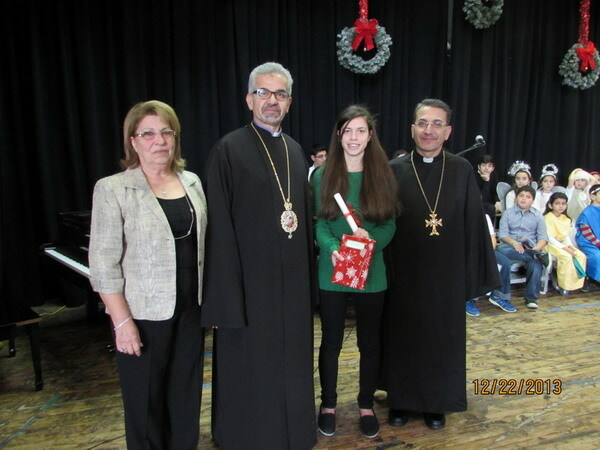 At the conclusion of her message, Mrs. Kejejian invited the Prelate and Fr. Razmig for the presentation of diplomas. 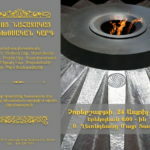 The program concluded with the Prelate’s message. His Eminence commended the director and teachers for their selfless service and the students for their performances. Speaking on the Feast of the Nativity and Theophany of our Lord, the Prelate stated that Christmas is an invitation to welcome the newborn Baby Jesus into our hearts and renew our lives, to be mindful of and give thanks to God for His blessings, and commit to living our lives with peace and love. Let us always remember the message of Christmas and let love, goodwill, and humility guide our actions and interactions, said His Eminence. The Prelate stressed the importance of Sunday Schools, stating that he himself began Sunday School at the age of four and that led to a lifetime of service within our church. Thus, he urged parents to make some sacrifices and bring their children to Sunday School so that they continue on the right path and in the future contribute to our church and national life. 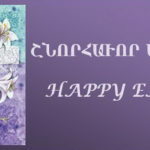 His Eminence also announced the recent publication of a book of prayers written by Prelacy Day and Sunday School students to their mothers on the occasion of the Year of the Armenian Mother, and read a few of the entries which were received with applause by the guests. Each student received a copy of the book. The Prelate concluded by wishing all a blessed New Year. With the blessing of the tables by the Prelate the program came to a close and guests enjoyed lunch hosted by the Sunday School committee.